D,L-Phenylalanine Capsules are a 50/50 blend of the D-and L-forms of phenylalanine. D-phenylalanine is used to relieve pain. 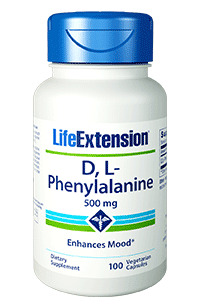 L-phenylalanine is used as an appetite suppressant, stimulant and antidepressant. Phenylalanine is used by the brain to produce norepinephrine, a hormone depleted by stress, overwork and certain drugs. One to two capsules are usually taken upon awakening, on an empty stomach. Phenylalanine should be used with caution by people with hypertension, as it may raise blood pressure in some individuals. If you have hypertension, you may wish to monitor your blood pressure with a home blood pressure monitor kit when starting out with small doses of phenylalanine. Phenylalanine should also be avoided by cancer patients. Dosage and Use: Take one capsule daily on an empty stomach in the morning, or as recommended by a healthcare practitioner. Best utilized if taken with the co-factors vitamins B6 and C.
Caution: May cause anxiety, high blood pressure, and headache. Do not use if you have phenylketonuria. Do not use phenylalanine or tyrosine if you have cancer or muscular dystrophy. Because phenylalanine can elevate blood pressure in hypertensives, consult your healthcare practitioner if you have hypertension. Insomnia may occur from overstimulation if taken too close to bedtime.